Sepia Saturday 391: Eighth in a series on piecing together the origins of my maternal grandmother Elizabeth (Stoutner) Laurence’s fashion sense. When I discovered that my grandmother’s Uncle John Stoutner won a first prize for waltz at an 1895 company picnic, I assumed he was participating in a once-in-a-lifetime event — a lighthearted, informal competition among colleagues to liven up a summer gathering. But it turns out Uncle John was serious about his dancing. 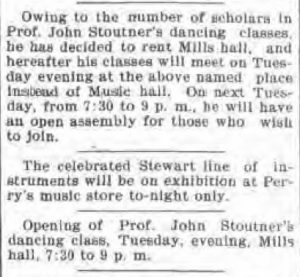 Because four years later — on Sept. 27, 1899 — the Gloverville Daily Leader announced the upcoming launch of Professor John Stoutner’s school of dance in Gloversville, Fulton Co., N.Y. So Uncle John, as a dance instructor, was imparting his special knowledge and skill — complete with an honorific that added a feather to his cap as professional milliner. 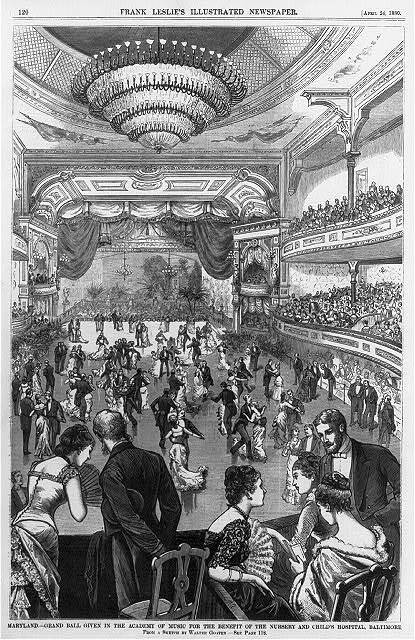 Apparently, social dancing was tremendously popular at the turn of the century, because another news article said Uncle John’s first class (held 118 years ago this month) drew 80 dance students. 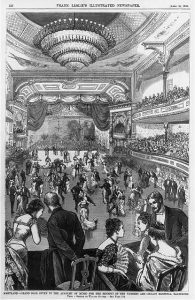 In fact, turnout was so good that Uncle John had to change venues for the remainder of the season from Gloversville’s Music Hall to the larger Mills Hall — where his second class was attended by 300 dancers and their friends! Nor was this the first extravaganza Uncle John had organized. 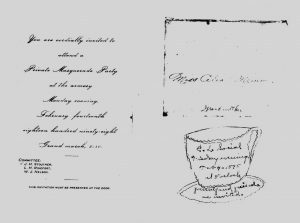 Among inherited family papers, I found a formal invitation to a Private Masquerade Party held on Monday, Feb. 14, 1898 at the Gloversville armory. Printed at the bottom are the names of the Masquerade Party Committee: J.H. Stoutner, L.H. Rinefort and W.J. Nelson. 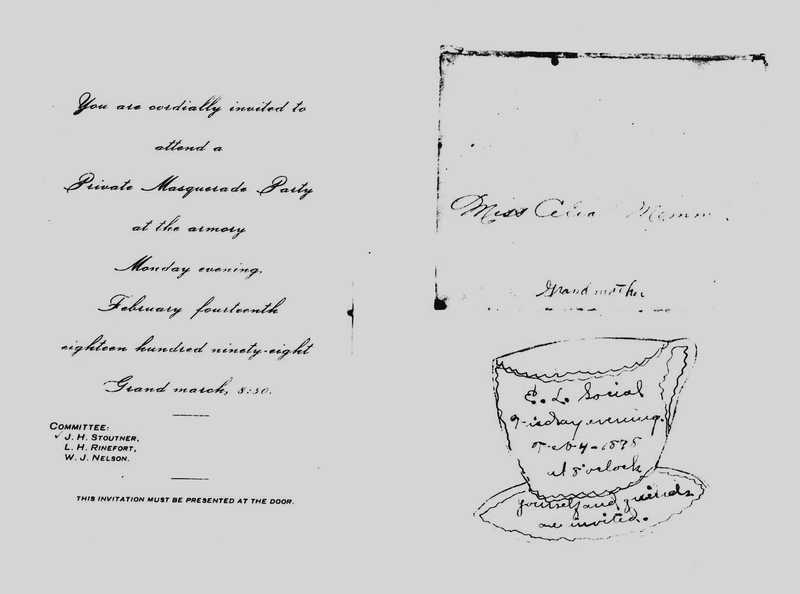 Tucked in with this announcement was a hand-drawn invitation inviting Miss Celia Mimm, my maternal great-grandmother, to attend another event Uncle John may have had a hand in — an E. L. Social held earlier the same month on Feb. 4, 1898. Celia, then 21, eventually became Uncle John’s sister-in-law when she married his younger brother — my maternal great-grandfather Andrew J. “Pete” Stoutner. Although I have no pictures of him teaching or waltzing or emceeing an event, I was nevertheless thrilled to discover this social dance history of my maternal grandmother’s Uncle John. Throughout my adult life, I have been a regular social dancer — favoring swing and Latin dance styles. My mother — a talented pianist, singer, composer and arranger — was a career music educator before she retired. My maternal grandmother Liz apparently danced socially — because I still see all the moves she taught me during my teens whenever someone breaks into the Charleston swing. Now it turns out that long before all of us there was Uncle John H. Stoutner — winning waltz contests, leading dance classes, booking halls and orchestras, and contributing his dramatic dancer’s dip to our family’s musical heritage! Up next: My maternal grandmother develops her own signature style. Meanwhile, please visit the posts of this week’s other Sepia Saturday participants here. Sepia Saturday 390: Seventh in a series on piecing together the origins of my maternal grandmother Elizabeth (Stoutner) Laurence’s fashion sense. When I was a teenager, my maternal grandmother Elizabeth (Stoutner) Laurence taught me to dance the Charleston. I figured she learned it from her peers during the 1920s — when she sported a short “flapper” haircut and rebelliously eloped with my grandfather. Yet it’s possible Liz was coached years earlier by her talented, quick-stepping Uncle John H. Stoutner. For not only was her Uncle John a milliner who operated a ladies fashion store in Gloversville, Fulton Co., N.Y. In his late twenties, he was also an award-winning ballroom dancer! My first hint of Uncle John’s acumen on the dance floor was the Aug. 19, 1895 newspaper article below from the Gloverville Daily Leader about the Booth & Company annual picnic. The lively story describes a sudden thunderstorm that sent everyone running for cover. Then — once the clouds parted — there was a dance contest in a pavilion so crowded the judges could barely make their way around. Despite the crush that “considerably incommoded” the dancers, Uncle John managed to make an impression because he was awarded the “first gentleman’s prize” for waltz — a set of pearl opera glasses. The “first lady’s prize,” a gold chain, went to Miss Nellie Dodge — but the article doesn’t say whether she was Uncle John’s dance partner. The waltzing competition was one of the highlights of the annual Booth & Co. picnic –along with tug-of-war contests and other sporting events that were detailed in the full article. Alas, no photo of Uncle John. But he must have been waltzing for some time if he was good enough to come in first among all the men who swept their partners around the dance floor. 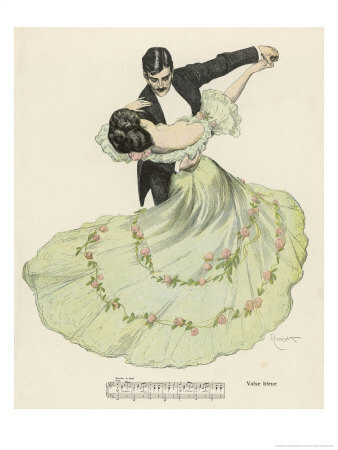 Beginning in the late seventeenth century and continuing into the early twentieth century, the Waltz enjoyed almost exclusive popularity in the ballrooms of both Europe and America. The Waltz, which is from the German word “walzen” and means “to revolve,” describes a graceful and romantic couple’s dance in ¾ time. Regardless of how my grandmother’s Uncle John became a dance enthusiast, he clearly continued to cultivate his talent after winning the waltz prize. Because four years later a Daily Leader article, dated Sept. 27, 1899, announced that Professor John Stoutner had opened a dance school! 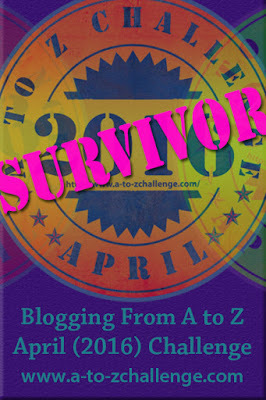 More on this new revelation in the next post. 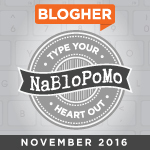 Meanwhile, please visit the posts of this week’s other Sepia Saturday participants here. Sepia Saturday 389: Sixth in a series on piecing together the origins of my maternal grandmother Elizabeth (Stoutner) Laurence’s fashion sense. The last post focused on Uncle John H. Stoutner as a possible influence on my grandmother Liz (Stoutner) Laurence’s sense of style. 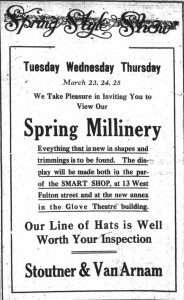 In the mid early 1900s, my grandmother’s uncle operated a women’s millinery and clothing store in their Gloversville, Fulton County, N.Y. hometown. But what led him to become a merchant? What more could I discover about his life and career? 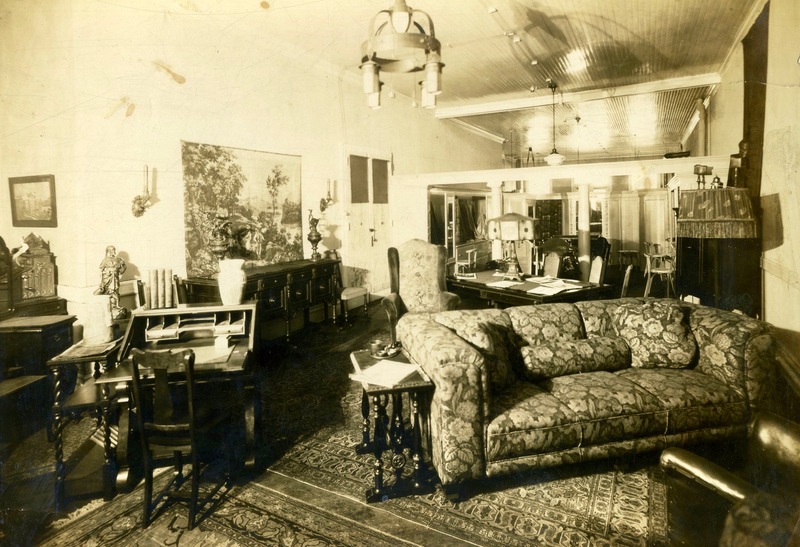 In addition to the photo of his shop featured in last week’s post, I have one more picture connected with Uncle John — a large photograph of his well-appointed apartment. I always thought it looked more like a furniture showroom, but on close inspection there seem to be no repeat items. There’s one couch, one dining table with chairs, one credenza, one desk — with lamps and accessories for each. My mom once shared what she remembered about him. “Uncle John had a hat shop and he was very aristocratic,” she said. “He was the ‘artsy’ member of the family.” The photo of his home certainly bears this out. Uncle John was married twice — first to Jennie Fairchild in 1890 (according to the Gloversville papers) and later to Josephine L. Bye in 1897 (according to Iowa marriage records). However, after both marriages ended in divorce, Uncle John appears to have embarked on a new, career-focused life. By 1905 he had secured bachelor quarters in the home of lumberman Jacob Van Arnam — a move that favorably impacted his personal and professional life. Jacob’s son Crosby became a close friend and eventual business partner — and the 1905 N.Y.S. census, excerpted below, gives Uncle John’s occupation as milliner for the first time. My grandmother was born in 1905 — so as she grew up, her Uncle John’s career in ladies’ fashion took off. The 1910 U.S. Census shows that John and Crosby were both milliners and employers. Crosby’s sister Hazel was a hat trimmer, possibly working in their shop. By 1920, John and Crosby were retail merchants in the dry goods industry — and Hazel had graduated to dry goods saleslady. Surely my grandmother’s family would have shopped at Uncle John’s store for clothing and accessories. Perhaps because he was a commercial buyer and seller, Uncle John’s comings and goings appeared in the Gloversville, N.Y. newspapers from time to time — summer jaunts to nearby Canajoharie, visits to Pittsburgh, buying trips to New York City. And then there’s this: In 1895, a man named John Stoutner was awarded first prize in a waltz contest at the Booth & Co. employees’ picnic. Wait — a waltz contest? Was this my grandmother’s Uncle John? More on this in the next post. Meanwhile, please visit the posts of this week’s other Sepia Saturday participants here. Sepia Saturday 388: Fifth in a series on piecing together the origins of my maternal grandmother Elizabeth (Stoutner) Laurence’s fashion sense. In the last post, I introduced my Stoutner ancestors from Gloversville, Fulton County, N.Y. Among them was family fashionista John H. Stoutner — a ladies garment professional who had the most potential to influence the clothing style of my maternal grandmother Elizabeth (Stoutner) Laurence. I knew little about my grandmother’s Uncle John growing up — just that he owned a “millinery shop,” according to my mother. Born in 1870, Uncle John embarked on his career at a time when women still wore extravagant hats, so this explanation made sense. 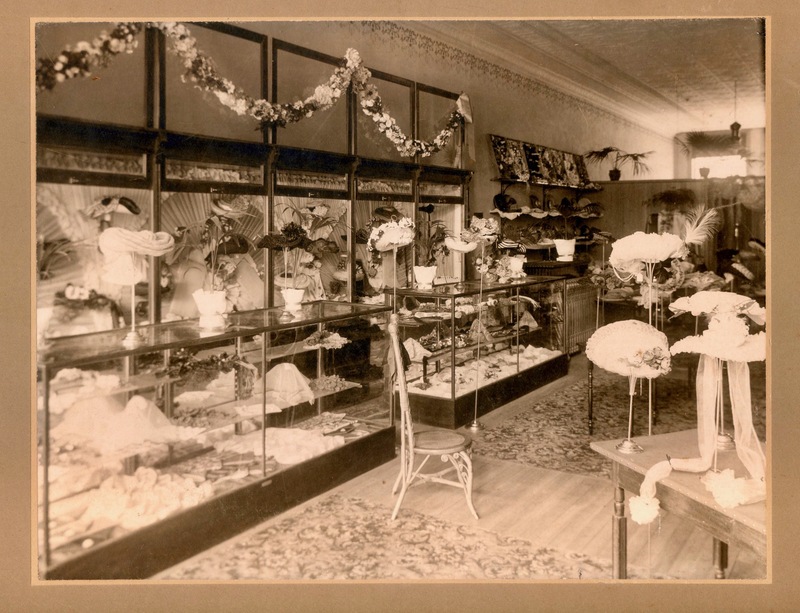 Later I inherited a spectacular photo of his Gloversville shop (above) and sure enough, there was the profusion of ladies hats — some behind cases and others decoratively placed on the selling floor. 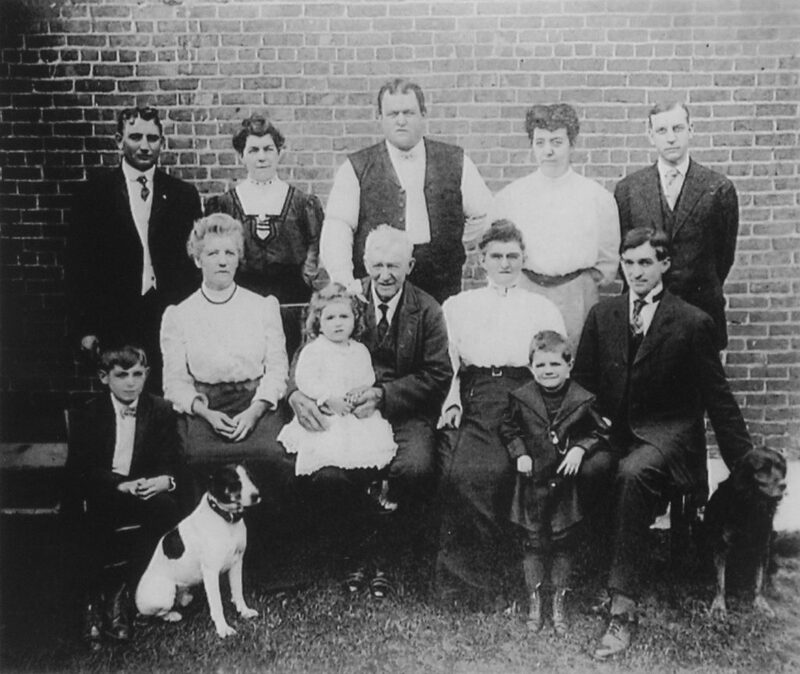 From the Stoutner family photo, I knew that Uncle John had a business partner, Crosby Van Arnam. I wondered whether newspaper research might tell me more — and I was pleased to discover several advertisements for their shop. 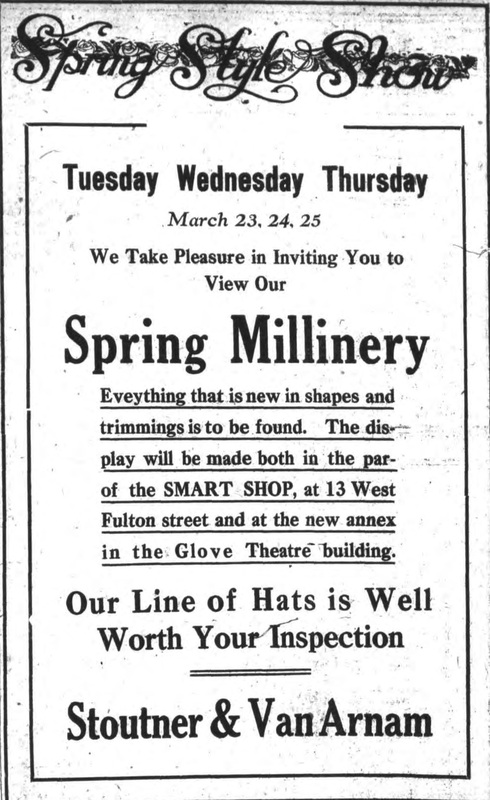 The one posted here, from the March 22, 1915 issue of the Gloversville-Johnstown Morning Herald, advertises the millinery portion of their store. However, other Smart Shop ads on the same page featured clothing and outerwear, indicating they ran a full-service operation. Uncle John and Crosby placed the ads to coincide with Gloversville’s Spring Style Show, giving the address of their shop as 13 West Fulton St. A Google search for a street view of this address reveals a row of charming row of storefronts right around the corner from Main Street. In the days before big-box stores, having an uncle in the fashion business meant my grandmother Liz and her siblings could be looking good at wholesale prices — and look good they did! 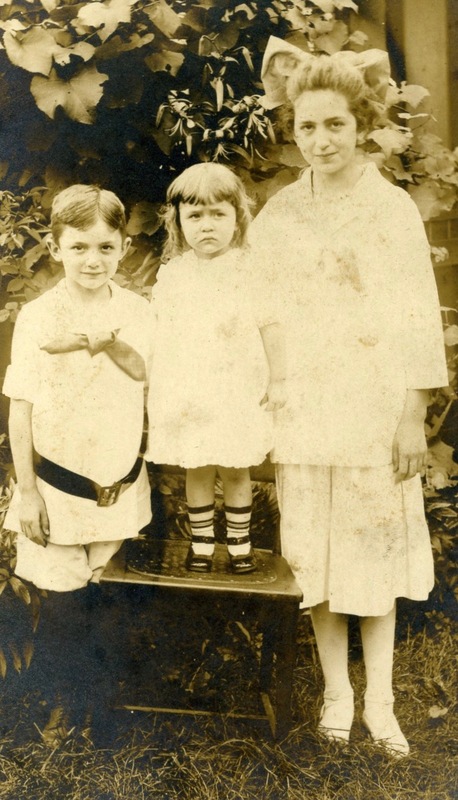 Here are the Stoutner siblings in a circa 1916 outdoor photo, each fashionably dressed. My grandmother Liz, at right, is nearly 11 years old and growing into a young lady. Her outfit is hard to make out, but it appears to be a sailor-necked blouse with a tie and a matching skirt. White stockings and stylish ankle-strap shoes complete her look — and for the first time she is wearing what would become her signature collar-style necklace. Next to her, Aunt Margaret is precious at age 2 1/2 with her long hair, little white dress, striped socks and black patent leather shoes. Rounding out the group. Uncle Andy, 7, sports an outfit that echoes my grandmother’s — with the variation of a low-slung belt and black stockings and shoes. Did Uncle John play a part in dressing the family? Hard to know for sure. But I suspect his garment industry expertise was looked to by his relatives — and may have influenced my grandmother Liz in a stylish direction. Up next: A bit more on family fashionista Uncle John H. Stoutner. 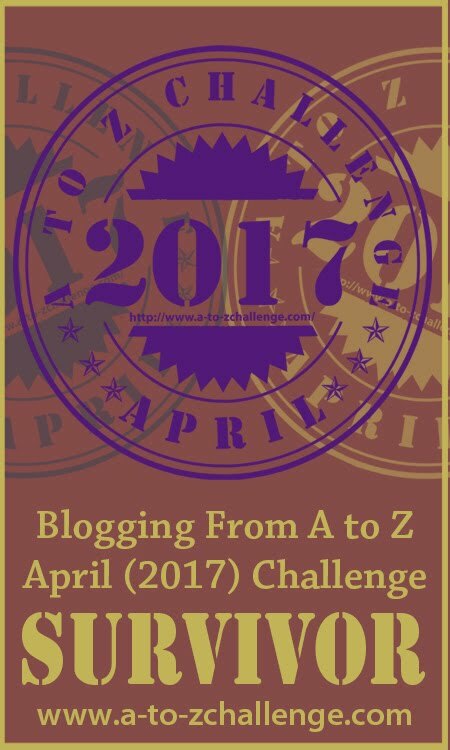 Meanwhile, please visit the posts of other Sepia Saturday participants here.